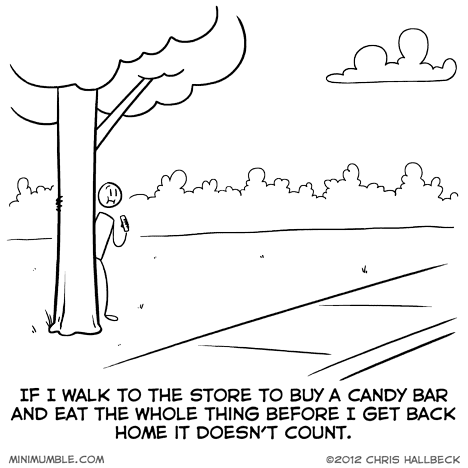 I didn’t look up the math but I’m pretty sur a candy bar is just 10 minutes worth of walking right? Also make sure you pay in cash. And don’t take a bag or a receipt. Don’t bring the wrapper home with you. Brush your teeth right after you get home. There you go! Nothing happened! Just went for a little walk why all the questions you are so suspicious I’m going to watch some TV now oh wait I have some important emails to reply to. If you find a coupon on the way that allows the purchase two candy bars for the price of one, that’s it. You’re toast. The mental gymnasics involved if you get a Twix are stressful enough, gods help you if you buy a Kit Kat. It’s always awkward for me to buy junk food, mainly because I always worry that the cashiers are judging me. Try doing it with food stamps, it’s much worse. Nevermind that when I do that, I’m usually risking a migraine or other allergy trigger, but I’m so tired of eating the same things all the time that I am getting a little “cheat” item for once. Let’s hear it for self-checkout.